It is what some consider to be Champagne season and what others feel should be the season at all times. I have to confess that I fall in to the latter category and love to drink champagne any time for no reason at all. The vibrant and awful characters, Patsy and Edina, of BBC television’s Absolutely Fabulous take my tendency to a new level unrivalled by any real humans I know. The characters’ objectives are to be “generally awful” and the two aging fashionistas with no fashion sense do it in a way that is so horrible that one cannot, at least I can’t, help but love them. Not even the deepest recesses of my id, super id or super ego wishes I could behave like them and get away with it, but there is one thing I do envy them: their absolutely fabulous champagne refrigerator. This refrigerator was installed in the remodel that was necessary after Patsy burned Eddy’s kitchen out by falling asleep with a cigarette in her mouth. It is the hallmark of the entire basement living area with one side containing NV Veuve Clicquot Ponsardin Brut from Reims and the other containing NV Bollinger Special Cuvee Brut from Ay. Both of these Non Vintage champagnes are the entry-level offerings of grand houses in Champagne, each of them solid and consistent in their taste from year to year. The most important feature of this refrigerator, however, is that when a bottle is taken from it, another is put in its place by a mechanical device so that no gaps are perceived in the refrigerator by any who behold it. I have experienced the Veuve Clicquot, but never the Bollinger or, as Patsy would call it, “Bolly.” Often during the course of the series the question, “Bolly, Eddy?” is uttered from Patsy’s snarled lips. I bought a bottle this season just so I could say those words to my sister who is also my champagne drinking partner in crime. One consolation that I have for myself in my longing to possess the ever full Absolutely Fabulous Champagne refrigerator is that these characters who will never be satisfied or filled by anything need to create this illusion for themselves. So as we find ourselves in the widely recognized Champagne season I have this wish for you: may your refrigerator be as full of champagne as you need or wish it to be. 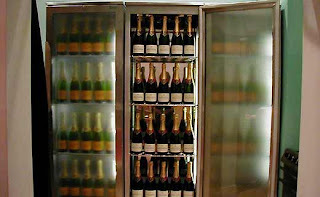 wow, the never-empty champagne refrigerator is actually the stuff of dreams. my wildest, most fabulous and free-wheeling dreams.